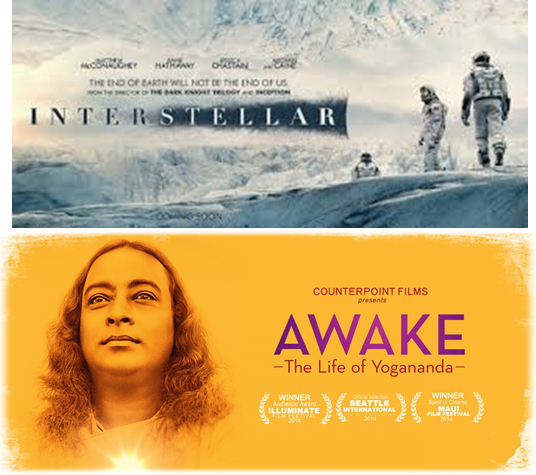 A new documentary film has come out about Paramahansa Yogananda, the first Indian yogi to set up residence in the United States. Fay and Mid saw it recently and enjoyed watching the movie so much that they decided to stay and see another one. Interstellar was just starting in the same Cineplex, and the ticket guy gave them complementary seats! A great crisis is going to come, a crisis such as never before has hit this country (America). The earth was created to bring souls to their divine destiny; it is carrying a heavy burden. Man should realize the ethereal nature of his being—made of light and consciousness, divine and indestructible, projected on the screen of time and space by the creative Cosmic Beam. Divine consciousness has no past, no future, because it is never interrupted, like man’s, by death or limitation. Eternal consciousness has one time—the ever present. God looks through the window of infinite consciousness on the films of finite happenings of the past, present, and future shown on the screen of time and space, continuously moving backward and forward in an eternal now. A true Fast is to cleanse the mind of all negative thoughts, while the lack of food is the icing on the cake. Mankind is connected by an invisible line, felt but not seen. It is truly possible to endure the best of both worlds but it takes much discipline and wisdom followed by great responsibility. Do not worry just keep on loving righteousness. Remember God loves you and all his creation. Even as our smile is a thought in the mind of God.